gained some weight after going blind so we needed to purchase a new one. also love the fact they are made in America! Keep up the fantastic job! Rebecca, Penny and Bleu too! I LOVED IT, LOUIE LOVES IT, WE HAVE A NEW PUPPY MOCHA, HES ABOUT 6 MO OLD, BUT NOT SURE IF I SHOULD ORDER ONE YET AS HE IS GROWING PRETTY FAST, BUT I WILL ORDER ONE FOR HIM ONCE HE SLOWS ON THE GROWTH SPURTS, THANK YOU, LOUIE IS A DACHSHUND RESCUE FROM DACHSHUND RELIEF SO. CAL. We received the harnesses and coats today - thank you. So impressed with the quality of workmanship - you are really good! Best wishes from Australia - Steve and Pauline … and Bella and Pebbles - the best-dressed Dachies in Oz!! I received my hug-a-dog harness for Noodle a couple days ago and just wanted to let you know it fits perfectly and I love it. In fact I am going to order another one for my other dog Lucy. I attached a picture of Noodle in her harness and as you can see she is very excited....not really at first, but once we went for a walk she loved it. 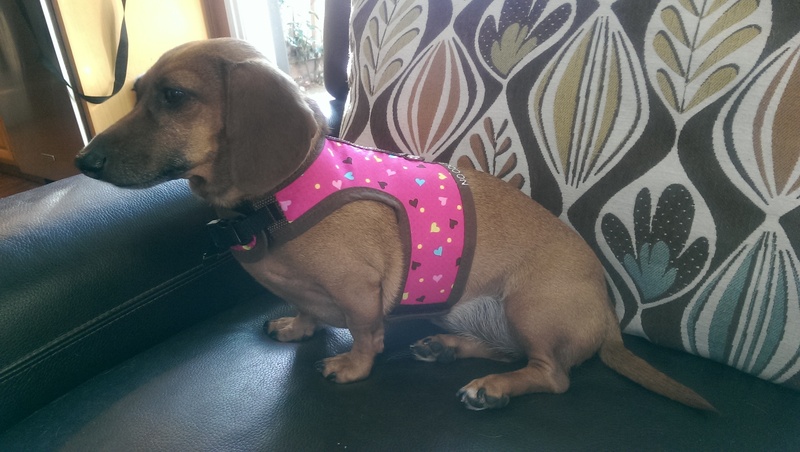 I received my harness for my dachshund and was very impressed with the quality of the product. It also fit my dachsie very well and this was due to them taking the time to contact me to make sure I have the correct measurements. My dachsie is very comfortable in this harness, much better than any other bought from the store. I would highly recommend Dachshund Delights to everyone. I will definitely be ordering from them again in the future. All harnesses fit my babies very well & they look like they’re so proud of themselves when we go for walks now. And I know the harnesses aren’t hurting vulnerable necks & backs. Thank you for these products! From me & my doxie triplets! This is our second Hug-A-Dog harness - we've worn the first one out and it's been great. I looked around at a lot of other harnesses for our doxie, but can't find anything that beats yours! Great product. My first Hug-a-dog product was a winter coat that I bought at a pet expo here in Pittsburgh PA. I absolutely loved the fit, and the fact that it covered my looooonnnnng dachshund totally. So the next product I ordered was the raincoat. I did not order on line, but actually called, because I had questions. The lady who I spoke to was fantastic! Very thorough, and very knowledgeable. I LOVE this raincoat! Now, I have a couple harnesses, but they velcro on TOP, and not underneath, so when I’m walking Cooper, the leash has a tendency to rub over the overlap and can cause the harness to open. Not good. I so love the design of the coats, I decided to place an order for the mesh harness. Not only is it lightweight, but the fit is perfect, and it does not impede Cooper’s movements. I also like the fact that there is plenty of room for his leg movement, without any rubbing or chafing. EXCELLENT design. EXCELLENT fit. And let’s not forget stylish! Thanks for such a great line of products for my most spoiled and special dachshund! Hi! I have three Hug-A-Dog harnesses from you that my shih tsus have outgrown. Initially you mentioned I could send the outgrown ones in for a discount on future harnesses. How would I proceed. Do I write it on my order? Thanks. Just let me know! I have purchased probably 6 or 8 harnesses. You are right – don't be fooled by copies. I bought one for a lesser price, and the harness came right off. So glad I was in the vet's office when it happened! Just wanted to thank you for your great service and dachshund products. I recently purchased a Hug-A-Dog harness for one of my 3 dachsie babies and I am very happy with it. Otto looks very handsome in it and didn't fuss at all when I put it on him. He has a delicate trachea and coughs with regular collars on him. I also purchased Snap-A-Dannas for all 3 of my darling dachshunds and they are so cute!! 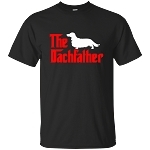 Thanks again for your dedication to dachshunds and I look forward to purchasing more products in the future. Oh, thank you so much for the Hug-A-Dog coat. It is absolutely perfect and covers my little one's back perfectly. He is doing a lot better, and we hope he's on the way to recovery from his autoimmune disease. I will take a photo of him as soon as he stands still long enough to do so, for he is so proud of himself in it. You all are just the tops for coming through so quickly to our aid. Bless you all. Editor's Note: We made a cloak without fleece for this dog – he has some skin problems and his mom wanted something that would protect him but not be too warm. Thank you so much for being a sponsor for the NC Wiener Roast last weekend. We all had a blast and a good bit of money was raised for the Doxies! You guys are great for helping such a good cause. We have several of your harnesses and love them. They are the best made that we have found. Just placed another order! Thanks again. It could have been a nightmare of all nightmares but it turned into a non-issue. I took Gabbey my little mini doxie with me to the bank and to PetSmart. I rarely take her anywhere but she likes to go but is a very nervous skittish little doxie who probably had a hellish life before me. She's tiny and around 11 years old. I put her in my single dog bed up in the front seat of my van. Of course, she had her harness on. We got to the bank and I put her in a critter tote and we went in the bank. She didn't seem to be comfortable in the dog bed so I put her in the crate in the back. We got to PetSmart and I walked her to the store and put her in the baby seat of the cart. She's afraid of any loud noises. We walked around the store and I had my hand on or near her the entire time. I checked out and when I was walking out of the store with her in the cart, she leaped up and right out of the cart. She was heading for nothing but concrete. Don't ask me how but I grabbed the leash and she ended up dangling there actually swinging from the leash. I was in such a state of shock that she actually leaped like that so unexpectedly, I think I held her in the air for about 5 seconds before putting her on the ground. If she had a collar on, she would have surely choked to death. If I didn't grab her, she would have hit the ground and depending where she hit would have either cracked her head open, broken a limb or worse, or been paralyzed. But the end result was we walked to the car. This is not the first time these harnesses have kept my dogs from being seriously injured. I guess I won't be putting her in any shopping carts. When I was walking into PetSmart a lady admired Gabbey's harnesses (the red Hawaiian one). She asked me where I got it and I told her I sell them to raise money for my rescue. She said "oh I have a Yorkie and I'd love one." I gave her my card, told her what measurements I need and she said she'd call. I took a double dapple to a foster home yesterday. Of course, the first thing I did was put a harness on her. When we got to the foster home we put a collar on her and the guy tried walking her. She nearly pulled her head right out of the collar. I cannot walk a dog with a collar on. By the way, if you ever have any used ones that you can spare, I could give them to my foster homes to use while the dog is there. I'm a nervous wreck with collars and try to remember to put a name tag on the dog in case it gets loose or out of the collar. Wishing you happy healthy pets. As a surprise to my mother I ordered a harness for our adopted dashie, Annie. Following the advice of the adoption agency we got her a harness to use for walks in lieu of a collar to attach the leash to. However, I noticed that the nylon harness kept rubbing Annie raw and was becoming very uncomfortable for her. After searching the web I came across your site. Of all the other websites that sold dashie specific harnesses I noticed that your harness was the only one that had a buckle in the front and asked for measurements of your dog. That is what sealed the deal for me. We have now had the harness for two weeks and what a difference. You can tell Annie is more comfortable in her harness and it fits her rather nicely, even our Vet likes it. Thanks again. Just wanted to drop a note to let you know how thrilled we are with our purchase. The workmanship is outstanding and the design for Bailee (our yorkie/peke) is too cute! I wasn't sure what my husband would think of the ruffles since he walks her a great deal, but he loved it! Sammy's Black & Red outfit is great, although next time will order it a bit shorter (from neck to tail). He's a bit stocky for a Chi (he was a rescue and tends to eat everything he can get to - we are working on that); we put the harness on him and called him "Sammy Soprano". We decided next time to have "Bad to the Bone Sammy" put on it. It took a while and lots of love, but he is part of the family now. Bailee is "big sis" and protects him fiercely - somehow its like she knows what he went through. As you can tell, we are dog lovers. Thanks for a quality product - worth every cent. We are moving to the Netherlands this Fall, so I may place another order before we leave. If I forget, do you ship overseas? If not, I have a son here that we could have it shipped to then he could forward to us. No matter. THANKS!!!! We received [the harness] and it is just adorable on our Jack Russel, Olivia. She likes it better than anything we have used to walk her and it is so easy to put on and take off. We are extremely pleased with it and plan to order another one, probably in mesh since the summers here are so hot. Hello! This past week, we received our Premier DreamSack, and our two mini wirehairs LOVE it! They knew IMMEDIATELY that it was for them. Once they got the tip of their noses just under the lip of the top cover – they torpedoed themselves right in. Thanks for a quality product (just like their Hug-A-Dog Harnesses). Received the beds. They are a perfect size and Stella and Max just love snuggling in them! They are such perfect beds for our little burrowers! Thanks so much for your "no hassle" exchange and for such prompt service. Just wanted to let you know I received my Hug-a-Dog harness and they are wonderful. Thank you so much. I will refer you to all of my dog lover friends. I just wanted to say how delighted I am that you are using a photo of my darling Amy wearing her gecko print harness as one of the images for solid fabric harnesses! I have used your great harnesses for years for my Brandy and Amy. I don't need any harnesses at this time, but just wanted to say hello and let you know that I give your website address to lots of my dog-owning friends. Hi! I just wanted to let you know that I got my dog Mika a dreamsack for Christmas. She absolutely loves it. I think this is one of the best purchases I've ever made. Besides the harness of course. Love that too. Anyway I just wanted to let you know I'm very happy with your products. I received "Gypsys" new winter coat late yesterday evening. I knew this thing was going to be pretty,but,WOW! This coat far exceeds any other coat in the pet stores. I even bought one from my favorite online pet supply website, Drs. Foster & Smith. The small was too small & the medium was too big, so having a custom made one just for her is well worth every penny. The dreamcatcher fabric with the yelllow trim is so pretty, it's unlike any other product out there. This is our 3rd harness so far, but I have a feeling the I will be getting another one in the spring. Willow's harnesses arrived yesterday afternoon and she is delighted with all three creations! My little sausage girl now has something to wear for autumn, the holidays and early spring. The substitute pattern for "Heart Filled" is just as cute – no returnees here! I wanted to let you know that the hug-a-harness saved our little mini dachshund’s life! A few weeks ago we were taking Roxy for a walk when she stopped to sniff a tree for a while. Next thing we know, a fellow dog owner yells over to us to watch out as his gigantic dog comes racing over full speed ahead. It was not a friendly visit. Before we could pick her up (it all happened so fast) he had Roxy is his mouth and was shaking her viciously while she screamed in terror. My husband and I frantically tried to free her. I pictured her completely mangled. Luckily, I think the mean dog had the harness in his mouth instead of her skin. I have no doubt if it weren’t for the added barrier that the harness gave us, she would have been a bloody mess. Luckily, Roxy did not have a single scratch on her and still enjoys socializing with other dogs. We had a very happy ending and I wanted to express my thanks to you. We received our harness last week and I want to tell you what a wonderful product you have. The ease in which you put the harness on and off is worth it's weight in gold. We took our doxie Malcolm for a recheck yesterday following ventral slot surgery and every single person, doctors and patient's parents alike wanted to know where we got the harness. Keep up the good work. I think I will order another one. Thanks. We got our DreamSack today and the babies just love it!!!! Thank you so much for this wonderful, beautiful baby bed:) You all are awesome!!! I received the 2 harnesses I ordered and my girls just love them. The special request harness for my dapple to line with fleece seems to have done the trick. No more bruising on her bald little chest! Thank you so much for a great job and such fast service! The harnesses I ordered recently have arrived, and just like our first ones from 9 years ago, they fit great, look great, and JennyB and Bandit love them. Hi there, I ordered one of your harnesses a couple of years ago for our little guy and he still loves it. I can't tell you what a difference it made to him when we switched from walking him with his leash and collar to using the harness. He immediately was sooo much happier and excited to go out for his walks. Now we were lucky enough to add another doxie to our family this past February and I'm anxious to order her one of her very own. When I used the vest for the first few times, I was a little worried that it wouldn't be strong enough. Gypsy gets into her moods & she likes to pull on her leash & chase after squirrels. Well, I worried for nothing. Not only does she NOT pull with the vest, but that little thing is a lot stronger then I thought it would be. We just received our second vest a couple of days ago. I'm resisting the urge to order a few more in the fabric with the colorful trim, but for now we'll just stick with the 2 we have. I am recommending this product to everyone I know that has a dog. I'm sure I'll be ordering again soon. Just wanted to let you know Maddie loves her new harness coat. It fits her perfectly as does the other harness I ordered. Thank you so much for making such a great product. I knew there had to be a special harness for my very special family member. Nothing else fit. You provide a great service for us dachshund owners. Thank you so much! Thank you so much for expediting the harness I ordered for my little doxie girl, Sunny. She is in the recovery process from spinal surgery for IVDD (ruptured disc). The harness seems more comfortable and she looks great in green – my kennel color! We received the new harness today. Just wanted to thank you again . It fits perfectly. I will be returning the old harness in tomorrow's mail. Thank you for such great customer service. And for standing by your products as you do. Thank you again. I received my harness for my dachshund that I ordered from you and it is so cute on Harley that I can't believe it! It fits him perfectly and the design on the material is wonderful. I know I will receive many compliments on it. I haven't seen any like it here in Ft Worth. Congratulations on a great idea. I just want to thank you for your wonderful product. I received your hug a dog harness for my schnoodle Baxter on Saturday. The size is perfect for him! It was easy to put on him and attach the loop to the seatbelt in my car. He wore it with no problems, and was able to play in it at the dog park. It seemd like he didn't care that it was on, so I left it on him for a while. It was also easy to remove. I feel that he is safely secured now in the back seat of my car. The next day he wore it to his first pet therapy class. The instructor liked it and would like to order one for her dog(s). Thank you for a great well made and useful product! Just thought I should ask is your Bo Bo toy the same manufacturer as the one at Pets Mart? If it is, you need to be aware of something. We bought one for our doxie. Within an hour she pulled out both eyes. Which were the bolt type. Luckily she did not swallow them. But we could not believe that this would be on a dog toy. The plastic eye was attached to a bolt. My husband works for a pet wholesaler that is picking up a line of toys with the Bo Bo toy but with cloth eyes. Just did not want you to have a problem selling something that dangerous. I know I don't have to tell you how fast a doxie can chew a toy. Well, anyway just saw that on your website and had to let you know. We have been a dachshund delights fans from the very start. Bailey has been in your newsletter years ago about 4 times. We love all of you. Merry Christmas. Editor's Note: Our bobo toys are the all-cloth kind. You can order them without fearing for your dogs' safety. Hello all, I was very pleased to receive my two trench coats today. My big boy, Renny looks fabulous, and the fit is perfect. As is my other for little Maggie. Really just great. Thank you so much, barks and kisses. We have already purchased 4 hug a dox harnesses for our two sweeties and they are godsends. Everyone comments on them, especially the colorful patterns. We are also planning to order new Winter pattern harnesses for them soon. 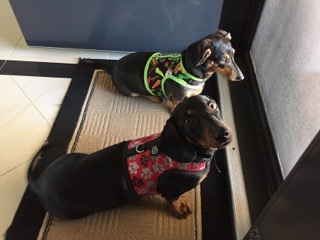 Thank you for the 2 fall harnesses for my doxies Brewster and Dudley. I received them within 2 weeks beginning to end. They fit the boys perfectly and they can't wait to go out carousing at the camp on Labor Day weekend. They know they'll get tons of compliments (and treats) and mom will be handing out your card to all the other campers. There are 450 sites. It seems that other sites have a lot of doxies or other breeds. Thank you ever so much for you perfection and detail you put into your products. Will be ordering again for Christmas. Can't Wait!!!! Take care, Love Brewster and Dudley H., oh yeah, and Mom too! YOU'RE THE BEST! Thank you so much for rushing our hug-a-dog harness to us! We know you had to really go the extra mile in getting it to us before our trip with such a short notice. The minute we got it we walked our Snickers with it and it fit absolutely perfect and he was noticeably happier and more comfortable. We'll be needing a couple more when our little ones get a tad bigger. Thank you again for accommodating us, we will be telling everyone about your products. THANK YOU, THANK YOU, THANK YOU for expediting my order for my Vizsla girl that had recent cancer surgery on her neck. My girl is recovering from surgery well and is able to walk on a lead with the help of your fabulous harness. There is no pressure on her neck, her incision is healing well, and MOST importantly her attitude is good because she is still able to go for a short walk!! The Harness "fit" is great … and I am just thrilled with your kind wishes and helpful cancer web site. We have a long way to go still … with beating this cancer … but you and your product have made the "road" a bit smoother for us. Thank you so very much! Jan S. and Emily, who looks so fashionable despite shaved fur and stitches! Last week, I received the order we placed at the Super Pet Expo in Chantilly, VA. I just wanted to let you know that the harness fit Riley, our English Bulldog, perfectly!!! I just got my order and the coats are just splendid … and they fit perfectly! Abby and Pumpkin have finally coats long enough to cover their backs. No wonder your newsletter is entitled Dachshund Delights. I can't wait to read each monthly newsletter. I found your site over two years ago, shortly after becoming the proud mom of a long haired mini named Tinker Toy. I haven't laughed or cried so much in such a short time. I grew up with my Nana having a doxie that was born the same day I was and lived to be 18 years young. I swore up and down that some day I would find the one for me. Nana's Fritz set the criteria so mine had a tall order to fill. She did instantly and the list became only two things: did she love me? did I love her? The answer was a resounding yes! And that started it all. My husband, who never dealt with doxies before got the surprise of his life. How could anything so small be so stubborn and oh-by-the-way wrap him so quickly around her little toe. He can't wait until we find the 'right' next one. Tinker Toy has raised a little Toy Poodle as her sister. Tawny thinks, acts, and eats like a doxie. She too has developed the doxie stubborn streak but has us both wrapped around her little toe too. They live with a 15½ year old BIG brother. He is a German Shorthair. They look to him for protection, comforting in an unsure situation, and someone to hide with when they have done a no no." A resounding thank you for a wonderful newsletter.